Chinese artiste, Tiffany Tang (唐嫣) filmed many drama including My Sunshine (何以笙簫默), Master of Destiny (風雲天地), The Princess Weiyoung (錦繡未央) and Europe Raiders (歐洲攻略). 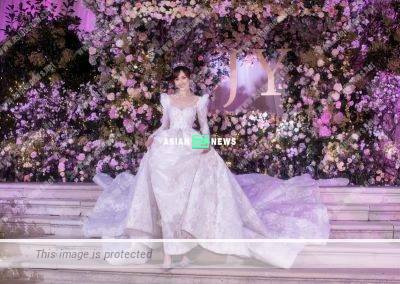 She tied the knot with Chinese actor, Luo Jin (羅晉) in Vienna a few days ago. Tiffany stands at 172cm and maintains her weight at 48kg and it is definite all women want to look the prettiest when getting married. Ever wonder what is her secret to maintain her “V” shape face, tiny waist and “chopsticks” legs? The public usually assume female celebrities have good body figures by nature. According to Tiffany previously, she said: “My face will become fat quickly once I eat any food in high calories.” Some online news reported that she treated it as eaten by looking and smelling it. Isn’t it sad to hear that? Once, Tiffany ate apples as 3 meals only and the nutritionist pointed that she would gain weight easily as the metabolism begun to slow down. Apparently, Tiffany is a “gourmet” and shares photos of delicious food such as cake, noodles and buffet frequently on Instagram. She always looks excited and her favourite food is hotpot. However, Tiffany will always find methods to lose weight after having a feast and even has a personal gym in her house.